Fresh Mexican-inspired food is always good. It is even better when it is vegan. 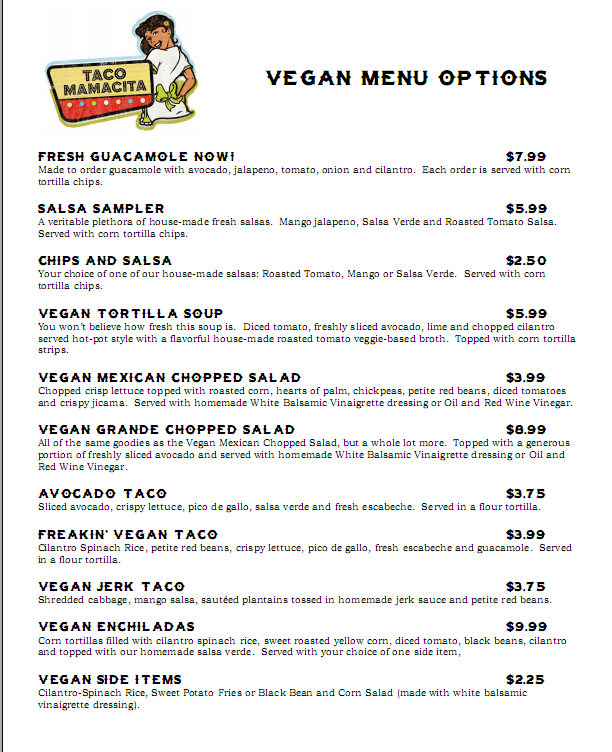 I got the word yesterday that Taco Mamacita’s would be rolling out a new vegan menu this week and also a copy of the menu. This happened around lunch time so where else should I head off to? I was told the servers may not be aware of the new menu and to take it along. After reading over the menu I was given I quickly realized that there were no vegan options and asked my server, Meredith, if she knew of the vegan choices. She told me she was also vegan and began showing me options on the menu by substituting and adding. Then I asked if she knew of the new vegan menu to which I got a “No”, so I pulled out my Droid which I had the menu on and showed her. Of course, being vegan also she was quite excited. 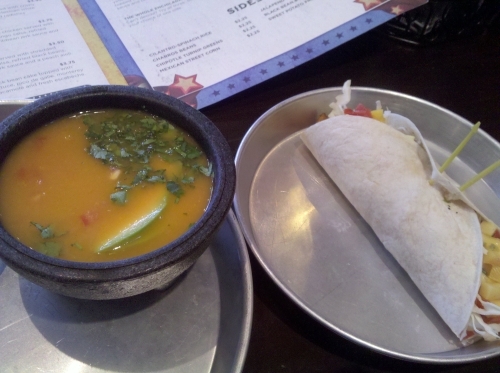 I ordered a cup of the Vegan Tortilla Soup and a Vegan Jerk Taco. The soup was poured at the table over fresh slices of avocado and cilantro with a side of tortilla chip crumbles and the taco was filled with one of my favorite delicacies, fried plantains, as well as fresh mango, beans and cabbage. Everything tasted extremely fresh but I thought the soup could have used a little spice as it was a bit flat. Overall, it was a good lunch, fresh and healthy tasting. The only thing I would like to see improved from what I ordered would be some flavor added to the soup in the way of spice. I left still hungry though I was thoroughly impressed with the freshness of everything. My next visit I will try something else and see if leaving stuffed is possible. A new restaurant has popped up in the middle of what used to be restaurant central where Beethoven’s once resided in Coolsprings. Chuy’s serves the standard Tex-Mex in an ambiance that seems like TGI Friday’s crossed with Joe’s Crab Shack. This location is the first one outside of Texas and has been met with extremely long wait times. Upon first hearing of their opening I brushed it off thinking there would be nothing vegan, let alone vegetarian, on the menu as most Mexican restaurants fill their beans with meat stocks or lard and chicken stock is a common find in the rice. After a bit of research I found this is actually not the case at Chuy’s and there’s actually a decent selection for vegans and vegetarians. Our first visit we had the Guacamole Tacos and Veggie Enchiladas. The only specification needed for the enchiladas and the tacos was no cheese. The ranchero sauce served on the enchiladas is vegan. 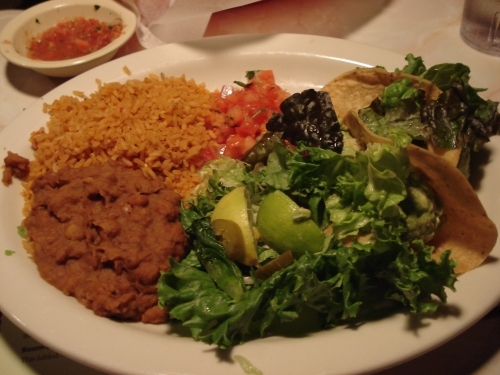 You have a choice of Mexican or Green Chile Rice and Refried or Charro Beans, all vegan. The enchiladas, filled with squash, peppers and onions, were a little small but the sides made up for the lack of filling. They are wrapped in blue corn tortillas but I’m sure you can substitute any of the tortilla selections if you want. The Guacamole Tacos, choice of hard or soft, were larger than expected with two good scoops of guacamole in each shell and topped with lettuce and tomatoes they were quite filling. On our second trip we split these for a late snack. All desserts are vegetarian but selections can vary by location so ask your server for options. UPDATE 10/11/2013: I regularly request vegan option information from Chuy’s since this post is extremely popular. With the last reply I received this veg menu from corporate. 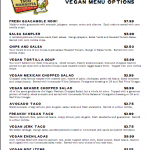 UPDATE 3/3/2015: I have checked again with Chuy’s corporate and am told nothing has changed in preparation or ingredients in the original vegan/vegetarian menu as posted above. Eat on!